I have found myself consumed with the question... "What does it mean to live or dwell in the shelter of the most high?" The thought is continued in the next phrase where the Psalmist speaks of abiding or resting in the shadow of the almighty? Again, what does that mean? My mind immediately went to John 15 and the illustration of the vine and the branches and how through their connection fruit is found.... the word used by John to speak of this relationships is translated "remain" in one version and "abide" in another. 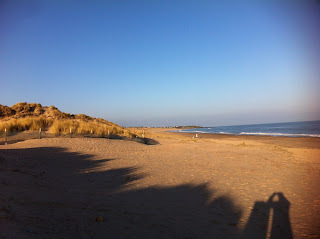 As I was musing on this I found myself walking the beautiful beach at Brittas Bay. It was an absolutely beautiful sun filled day. As I walked I became profoundly aware of my shadow and my thoughts went back to this passage. "who abide in the shadow of the almighty"
Do I live close enough to God that I rest within HIS shadow?